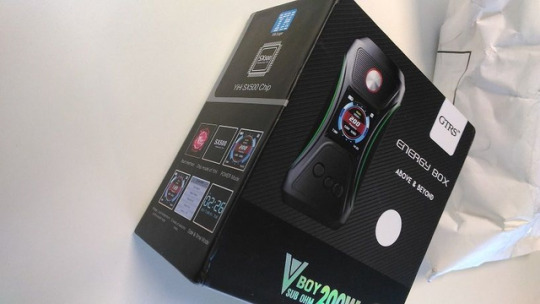 The GTRS VBOY 200W Box Mod comes in a very compact packing box. In the package, it contains the box, a USB cable for charging, a fabric box bag, a cleaning clothing, the warranty certificate, and the instruction manual. What I get is the white and black version, then white bag, white doors, white interior and white ball on the box to identify the color. It's all metal, apart from the side doors that are made of non-slip rubberized material. It is very solid. It is standard in weight with dual battery. It is very sturdy. It has been down 2 times. Only several scratches on it. The 1.3 color display screen is recessed by several mm to protect it from accidental bumps or falls. An improvement in the painting would be better. I have got a few scratches on the door. The cup is 24mm in diameter but can be mounted with the atomizers up to 28mm. It also has an upgrade for the serious 2. In the first batch of the box, it was easily detached. Version 2 has no problem with this. You can "uncork" dripper with granitic O-ring, without coming away and without even affecting its position. The GTRS VBOY 200W Box Mod is not small in size with the 48x90x31mm. It comes with a very ergonomic design with a narrow in the center. Also, the position of the fire button is optimal, both for right-handed and left-handed. I do not like the position of the 3 control keys (- enter +). They are not that bad, once you get used to it. All the keys are precise and don't miss a shot. But let's talk about the strength of this box -- the YiHi sx500 chip. YiHi is a guarantee of quality and this chip. It reads resistances between 0.05 and 3 ohms, in any operating mode and can reach up to 200W. It is very precise, delivers the watt set up to the last drop of energy inside the cells, unlike any other chip tested today, which instead tends to fall with the fall of batteries. There are 3 modes of operation: Watt, TC and Joule mode. And there are 5 adjustment modes: Soft (-10%), Standard, Powerfull (+ 10%), Powerfull + (+ 15%) and Custom. There is no bypass mode. It has 5 memories available. The menu is the standard YiHi. All explained perfectly in the instruction manual. It is also on the manufacturer's website: http://www.gtrstech.com/Product/view/id/769.html. Some functions in the G-Class are missing, but not the basic ones. In addition, the box is upgradable with YiHi SXi software. The USB charging is excellent. I happened to use it. I must say that it is very good. A small note of demerit. It does not have the passthrough function which means while you are reloading, you can not vape. You can also use different batteries and with different charges. We think the chip to balance the current draw or charging it through USB. I recommend using identical batteries with the same operating cycles. He obviously has all the possible and imaginable protections.